Pessimism about our spacefaring future has become fashionable these days — people point to our limited lifespans and energy resources. But the World Of Technology blog just posted an argument I haven't seen before. Blogger mayank points to all the usual reasons why it'll be hard for our descendents to reach the nearest star system, Alpha Centauri: it would take 75,000 years withour current rockets, going faster requires more and more energy, etc. "Sending a 100-ton habitat, stuffed with a small crew, to Alpha Centauri at a speed that will deliver them before they turn up their toes requires as much energy as the United States consumes in a year." But then there's also another point to consider: Mayank points out that in the past 70 years, our rocket technology has only gotten about 10 times faster. In about half that time, our imaging capabilities have gotten 5,000 times better and clearer. The Mariner 4 space probe in 1965 had a monochrome camera capable of capturing about 40,000 pixels. By contrast, the HiRise camera on today's Mars Reconnaisance Orbiter has a resolution of 200 million pixels, in color. 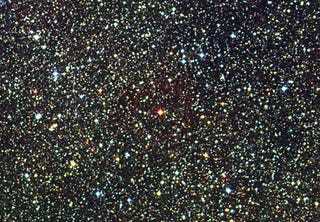 Proxima Centauri image from Astronomy Picture Of The Day.